CATHOLIC GIFT SHOP LTD - 925 Virgin Mary Cameo Necklace with Marcasite Stones. UK orders usually delivered in 1-3 days! 925 Virgin Mary Cameo Necklace with Marcasite Stones. 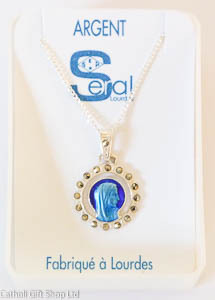 Virgin Mary cameo necklace with marcasite stones this necklace would look fabulous with any item of clothing. Swarovski Cross & Acorn Rosary�Gift Set. 3 Oval Lourdes Water Bottles With Blessed Holy Water. 18 Carat Gold Plated Large Miraculous Medal Necklace. Catholic Gift Shop - Our Lady of Lourdes Religious Gifts, Holy Water, Miraculous Medals, Holy Cards, Rosary Beads, Virgin Mary Statues, Religious Christmas Gifts ideas and Discount Catholic Products are all in our online Catholic Shop. Customer Services / Shop Hours: 9am - 12pm & 1pm - 4pm, Mon-Fri. Most of our products are sourced locally in Lourdes and all prices are inclusive of VAT. VAT registration no. 206 8481 05. Orders will be dispatched via our UK distribution centre. Catholic Gift Shop Ltd is a limited company registered in England & Wales with the number 8884705. Can't find what you are looking for? Why not try our sister shop Divine Christian Gifts.